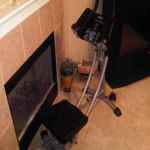 In my article about the best exercise equipment to invest in I mentioned some of the equipment that I own. Some of the investments have been good ones while others have been total misses- for me anyway. I either own or have owned the following: The Pilates Home Workout Gym; The Ab Coaster Pro; Exertec Ftiness Trampoline; The Ab Roller; So these are the workout machines that I will discuss briefly below. Send me your feedback, experiences, and questions. The Ab Coaster Pro was a short-lived investment. I watched the infomercial and I thought that it would be a great piece of equipment to have. See I have this "ab" thing. All I needed to do was lose weight in my mid section (so I thought). Of course, and I will mention it again, the ab spot reduction is a myth and cannot be achieved without overall fat burnning. And the company obviously knows this because they included dvds containig cardio workouts. That's right, you do cardio workouts with the dvd and then you hop on the Ab Coaster and do the ab routines. The equipment works if you include the cardio workouts. Thing is if you do cardio and crunches, you can accomplish the same results without a $400 piece of equipment. But, I repeat, used the way the company suggests, you can get good results. As you see in the photo mine was a fireplace ornament (until I finally sold it). This one wasn't a very good investment for me. You see at the time I purchased this I thought that I could spot reduce. In other words, I thought that I could just focus on exercising my abs (alone) and they would flatten. Not! Spot reduction is one of the biggest myths in weight loss. After I learned that I needed to lose weight all over in order to see great results with my abs, the Total Core Ab Machine went under the bed and was never used again. To the company's credit, they did include dvds to help with the workouts, but they bored me to tears. Also, the equipment was sort of awkward. I'm sure for some this may be useful. I had an Ab Roller years and years ago (when I was more fit) and I liked the motion and movements, but with Total Core, the wheels and the motions were strange. Sorry I can't explain it better. I guess this particular exercise machine just wasn't for me. 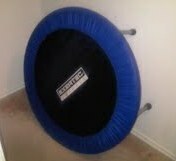 I read in some fitness magazine that trampolines were good for exercising and losing weight. So I asked a coworker (a very fit nutritionist) what she thought about trampolines for working out. She was enthusiastic and even shared that she owned a small trampoline herself. She said the trampoline makes cardio workouts fun. Taking her enthusiasm to heart, I decided to purchase one. I went to the local academy sports store to check them out. I settled on the Exertec because it was small and the price was within my range. It was fun at first, but after about a month, I just lost interest in jumping. It was great because it took the impact off my knees and it was fun, but not fun enough to keep me interested. Eventually, it became a toy for my nieces and nephews to play with whenever they visited. Oh, well...at least it didn't cost me very much (somewhere around 25-30 bucks). It was a low risk investment. If I were to recommend any of these machines, it would be this one. The Pilates Home Gym comes with workout dvds for different fitness levels and the instructors demonstrate various ways to use the equipment for a really good whole body workout. Another informercial, this time HSN. I paid $350 for it (on flex pay). 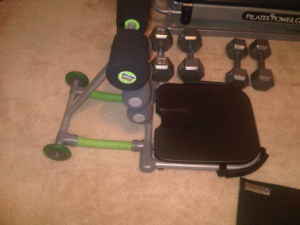 I really like this equipment and have both lost weight and toned up using it. In the photo you see this one sitting down collecting dust though, because with my home workout program, I don't need equipment. But, this one, as I said, is a good investment in my opinion. It's not very expensive (relatively) and takes up very little space. If you use it 3-5 times per week for 20-30 minutes at a time, you will see results. Some of the mentioned equipment may be out of your price range or may even be to large for your workout space. 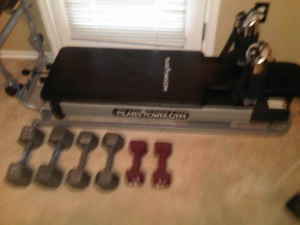 Keep in mind I also own smaller peices of workout equipment like Resistance Bands & Weight Sets. Hope me sharing my personal experiences has helped in some way. Send me your feedback, experiences, and questions. Tell me your thoughts on this particular post. Was it helpful? Do you have a personal experience you'd like to share? What are your thoughts? Your question/comment will appear on a Web page exactly the way you enter it here. You can wrap a word in square brackets to make it appear bold. For example [my story] would show as my story on the Web page containing your story.